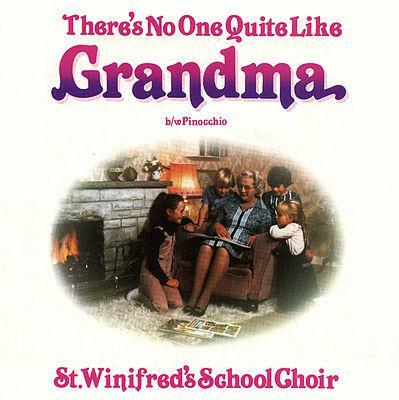 "THERE'S NO ONE QUITE LIKE GRANDMA"
This sickly sweet 80s hit reached #1 for two weeks from 27th December 1980, spending a total of eleven weeks in the chart. The song knocked John Lennon's (Just Like) Starting Over off the top spot, but Lennon fans bought the single Imagine in their droves, and then got sweet revenge by knocking There's No One Quite Like Grandma off the top spot! It features the ex-Coronation Street start Sally Lindsay (see photo below) who played Shelley Unwin between 2001-2006 - can you spot her? The choir were from Stockport in the UK and the lead vocalist with the cute lisp is Dawn Ralph. She was later offered to opportunity to play Annie in the West End, but declined the offer. If fact, she made a decision to stay out of the limelight and has turned down numerous offers to appear on TV shows to discuss the single. Although this is a truly irritating song, at least the kids in the 80s were singing about Grandma, rather than mugging her! Not quite a one-hit wonder, though, as they also provided the backing vocals to Matchstalk Men and Matchstalk Cats and Dogs by Brian and Michael which was also a #1 in 1978. That particular song was about the artist J S Lowry. I say, that's a nice looking pint!